ISR is part of the Construction Management Team providing Resident Engineering and Overseeing the Commissioning and Testing for the expanded electronic security system to enhance the overall physical security of the Throgs Neck Bridge? ISR provided Security and Communications Systems Engineering, Management of the Testing, Commissioning as well as Training, and Integration with Legacy and NY Police Department Security Systems on the NYCT Chambers Street Electronic Security System project. At the outset of this project, ISR identified all required tests and inspections, and associated submittals, and developed comprehensive project test plans and test procedures. ISR led the oversight of the system implementation, integration, testing and commissioning and the test and commissioning certification of the numerous communications elements of this integrated ESS. ISR also wrote and compiled OEM Manuals and Training Manuals and provided training. 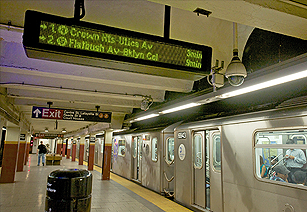 The project included the introduction of approximately 70 cameras in the mezzanine and platform areas of the Chambers Street and Brooklyn Bridge stations, an access control system to monitor authorized and unauthorized access to tunnel ingress routes, installation of a laser intrusion detection system to cover the tunnel ingress routes, and installation of system and network control equipment to support monitoring and control of these systems from the Security Operations Center.